Pensacola State College graphic design and photography students won 52 awards in the college/university student division at the recent 2017 American Advertising Federation Pensacola ADDY® Awards Gala. In the professional division, PSC Graphic Design program coordinator Mark Hopkins earned a silver ADDY for his entry “Miss Simone” in the single poster category. 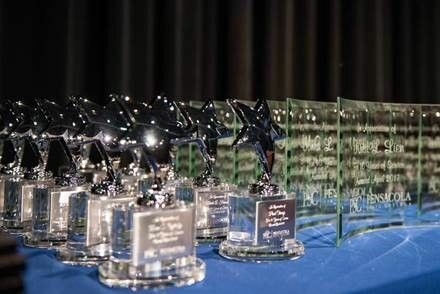 In Pensacola State’s largest ADDY win to date, 22 PSC students garnered 19 gold medals, 30 silver medals, and three Judge’s Choice awards in the competition that included work completed in 2016. Noting the exhaustive time and effort that students put into ADDY competition entries, Hopkins said PSC students are working for more than recognition. PSC Visual Arts Department Head Krist Lien added the ADDY Awards process is a great way for students to see how their work compares to others outside of the classroom. 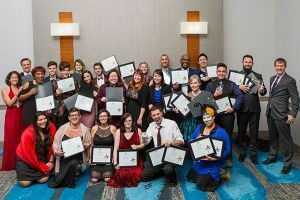 “It’s not uncommon to see one of the area’s professional designers approach a student after the ceremony to talk about their work and a possible job. Our department has added several internships offered solely on the quality of student work that the professionals see during this annual event,” Lien said. Winners in Pensacola State’s graphic design baccalaureate program were Kelly Bestgen, three gold and Judge’s Choice; Kyle Stamm, two gold and Judge’s Choice; Zach Blessing, two gold and Judge’s Choice; Danielle Engert, three gold and seven silver; Amber Sidner, two gold; Jordan Sullivan, a gold and a silver; Libby James, a gold; and Lauren Campbell, a silver. In the college’s graphic design associate degree program, winners were Omar Forty, gold and silver; Whitney Hood, gold; Libby James, gold; Becka Ware, gold; Katherine Wong, gold; Darrian Montgomery, four silver; Hannah Peltier, three silver; Kelly Bestgen, two silver; Kristi Breeze, silver; Katherine Chen, silver; Jonathan Dunham, silver; Nicole Durst, silver; Karli Kimmond, silver; and Kyle Wilkins, silver. PSC photography program winners were Chelsea Zachary, two silver; Tim Bednarcxyk, silver; Kristi Breeze, silver; and Darrian Montgomery, silver.